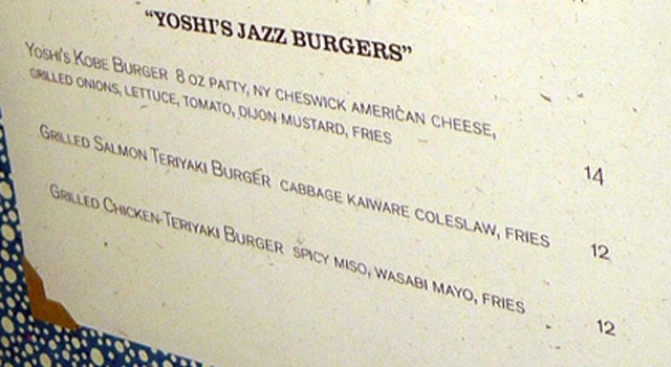 The new Yoshi's menu has burgers on it. The Fillmore: It's been a while since we've checked in with the state of affairs at Yoshi's. Last we heard, the jazzy giant was cashing the city's checks for a few million dollars, but on the food side, sometime in the last few weeks, Chef Sho Kamio has put burgers on the menu. Three of them, in fact. Now, in a city that loves its casual dining like San Francisco, restaurant owners are in a constant dilemma whether or not to compromise and stick a beloved burger on the menu. Yoshi's has come a long way since opening with an upscale, exotic, non-Americanized menu, and then getting 3.5 stars for food, but with the economy as it is and new downscale spots like Bruno's opening nearby, we suppose making the menus more accessible is a must.